A Journey from ConCom to FedCom? 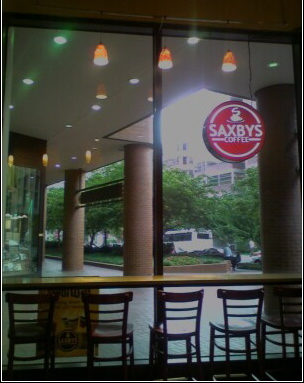 We find ourselves this evening sitting here in the newest coffee establishment in Dupont Circle (see photo). I’ve been thinking (sometimes rather irreverently) about the current “conversation” going on over at StandFirm between what Sarah Hey has described as the Conservative Communion folks (ConComs) and the Federal Communion folks (FedComs). The ConComs are those who are working within the current Episcopal Church structures while the FedComs are working outside those structures. I find myself somewhere in between. I have been a ConCom for over twenty years. How did I become a ConCom and how do I now find myself in a FedCom boat? In around 1984 I went to an organization meeting of The National Organization of Episcopalians for Life. For the next seven years I worked as the editor of The NOEL News and learned not only about political and theological advocacy, but more and more about the wider church beyond the walls of Truro Church in Fairfax. Every year NOEL would take part in the annual March for Life in Washington, D.C. and it was at those annual gatherings that I met more and more Episcopalians from all over the country – high church, low church, evangelicals, Anglo Catholics, and charismatic versions from the Episcopal Church and my scope over what it meant to be Anglican grew wider. Then in the summer of 1994, Diane Knippers invited me to come to my very first General Convention. My job was to make lunch each day for the “team” – then consisting of a deputy from Virginia (John Guernsey), a deputy from Pittsburgh (Jim Simons), a priest from Chicago, two staff members from IRD, and a smattering of others who’s names I never learned. I’d make the sandwiches at the rented condo fifteen miles outside of Indianapolis and then drive in and meet everyone in a corner of a hall and hand out the sandwiches. That was my job. Before General Convention ended, though, I was drafting testimony, attending hearings, testifying at those hearings, monitoring the House of Bishops and witnessing that the wider church, one far more reaching than what I knew back in Virginia or in NOEL was – to put it mildly – shocking. I still remember heading for the afternoon meeting of the House of Bishops, pleasantly waving from the escalator at my former rector, now the Bishop of Central Florida, as I saw him heading into the House of Bishops and then turn to see the newly-retired Bishop of Utah, still in his purple shirt, passionately kiss his male partner on the escalator next to me. By the time I finally returned to the House of Bishops meeting, it was coming to an end and John Howe was over at the trashcan ceremoniously emptying out the contents of his official General Convention Bishop Binder. That fall I was in London and attended my first Alpha Course at Holy Trinity Brompton, an Anglican parish in Knightsbridge, London. How far away Indianapolis and General Convention seemed to me by then, now surrounded by hundreds and hundreds of young Christians my age who were enthusiastically embracing Jesus and the heart of Anglican Christianity. It was a robust Christianity, where questions could be asked – but not to stop there, that questions could be answered through the reading of Scripture, through worship, through prayer and in fellowship. It was a dynamic and exhilarating experience as this parish was alive for Christ, filled to the brim with life and love and worship of the risen Lord Jesus. Indianapolis began to fade away. While I did get more and more involved with Alpha as it was introduced to North America (one of the first Alpha Conferences was held at Truro in 1995) I was also getting more involved in the wider Church, sometimes blending the two together – working to bring Alpha to Episcopal audiences at General Convention, but still doing much of the same things I did in Indianapolis – though people were now spared my sandwich lunches. I was writing more now, doing more media, and began to build an e-mail list to send reflections of the day to those who were praying for the future of the Episcopal Church back home. So Philadelphia 1997 followed and with it the election of new a Presiding Bishop. Now the orthodox were growing, the circle widening. Anglo Catholics were now joining Evangelicals, an alliance that was not only historical, but miraculous. I can remember sitting on the floor of a room in the late hours after a long day of legislative sessions, listening to speakers give their reflections of the day and what was next and where we were going. In the midst of it all was still a great sense of humor, and the camaraderie was what made these gatherings special. We might be in a foxhole together, but at least it was with fun people – and they didn’t have to eat my sandwiches anymore. Following Philadelphia, leaders in Virginia from all theological and political spectrums were invited by the Bishop of Virginia to join what turned out to be a seven-year listening process on sexuality, where a real dialogue was taking place in discussing where the Church should stand on issues of sexual identity and marriage. The group was named after a Diocesan Annual Council Resolution, R-7. This group would prove to be a watershed gathering, seven years in the making. Denver followed in 2000, and then Minneapolis in 2003 and finally Columbus in 2006. I spent much of my time for all those meetings in the newsroom – starting with just a handful of religion writers in Philly to a mass of international and national media by the time we got to Minneapolis in 2003. I had drafted testimony and testified at more hearings than I can now remember, staying up until the wee hours talking and planning and writing and researching – hours and hours of learning, realizing that we were twenty years behind those who were bent on taking the Episcopal Church in a Brave New Direction. In Denver there seemed to be a ray of hope, that somehow the Church might (if not quite turn around) slow down from its relentless march off the theological cliff. I can remember being devastated after that General Convention ended when foxhole comrades left to join what was then First Promise and later became the Anglican Mission in America (AMiA), shouting over the phone at Diane Knippers how upset I was that these friends who had walked so closely with us at Denver were now giving up and we’d only just started! There was so much more to do. We had slowed down the imperial march. How could they give up now? I was deeply troubled – how could we continue without them? There are times now that I hear the echo of my own voice then, seven years ago, when I read Ephraim Radner or others in ACI today. It was clear to me at Denver 2000 that change couldn’t happen on the national level until it happened on the local level, so I became involved in the local region in the Diocese of Virginia. I had just finished my first three-year term on the Truro Vestry and began to get more involved in what is called Region VII, one of the fifteen regions that make up the Diocese of Virginia. Region VII encompasses the section of the diocese in Northern Virginia where churches were renewed, traditional, and progressive. The region was a microcosm not only of the Diocese of Virginia, but in many ways of the national church. I was elected as Secretary and began to get to know the leaders in the region, as well as in the Diocese. If we could just figure out how to do it at home, perhaps then we could figure out how to do it nationally. As we approached Minneapolis in 2003, though, it became clear that what the leaders now in AMiA saw coming seemed closer to the truth. Any hope we may have had to foster a reversal of what TEC (then called ECUSA) saw as spirit-led destiny of “full inclusion” was slipping away. Anyone who stood in opposition or lacked enthusiasm for full-inclusion was doomed. I still couldn’t believe it. The progressives had found a way to go around the usual liturgical revisions and writing new canons by forcing General Convention to affirm the election of the bishop of New Hampshire, Gene Robinson. It was ingenuous – a brilliant way to move fast in an arena that was the progressives home territory. I had arrived in Minneapolis a week after the convention had started and was met by a member of our team at the airport who told me that things were not going well. She was devastated by what she’d seen all ready in the open hearing and within a few years after Minneapolis, she would depart the Episcopal Church to “cross the Tiber” to Rome. She wouldn’t be the first. I was sharing a hotel suite with a team from Truro including Diane Knippers, recently diagnosed with an advanced form of cancer. Ironically, she was often the one most upbeat. After each day of General Convention a small group of us would reconvene at the hotel for Compline and prayer and I felt like I was going to need to learn everything I could from Diane in whatever time there was left to her in this life. The affirmation of the election of Gene Robinson as bishop of New Hampshire, a masterful political stroke by the progressives to take Denver back and spin it around, was unforgettable. While the General Convention erupted in massive celebration, I can still see the bishops of the Anglican Communion Network (ACN) standing in the hallways outside the House of Bishops, their faces grim and sober. The inability of the Episcopal Church leadership to fathom how this would affect the rest of the Communion, the lack of caring about what anyone else thought, the gleefulness that this was, as the Rev. Susan Russell put it to a hoard of captivated national and international media, “Easter Day!” was striking and unforgettable. That evening I went to a gathering at a local pub of the delegation from the Diocese of Virginia (I was an elected officer of Region VII) and was greeted by my bishop, Peter James Lee, at the door. He was wearing his trademark blue and white pinstripe summer suit complete with bow tie, looking more like a gentleman at a Charlottesville Country Club then a bishop. “Hello Mary,” he greeted me pleasantly, as though this was just another lovely summer day. “Hi Bishop Lee,” I said, shaking his hand. He asked me how I was. “I’ve been better, to tell you the truth,” I said cautiously, and then went ahead and asked him why he voted to affirm the election of Gene Robinson as bishop of New Hampshire. “Don’t you understand what this is going to do?” He either didn’t know or didn’t care. I still don’t know the answer to that. The next morning I was awakened by the radio news on the hour at 6:00 a.m. with its lead that the Archbishop of Canterbury was calling the Primates of the Anglican Communion together for an emergency meeting, following the events of the Episcopal Church General Convention in Minneapolis. “Oh my goodness,” I can remember saying out loud, calling out to the other team members in the suite. “Canterbury understands.” I was so surprised by his swift response. More e-mails and responses were coming from Anglican primates and bishops from all over the globe, but it was as if the rest of the Anglican Communion did not exist to those gathered at General Convention. Now I sometimes wonder what happened to Rowan Williams understanding. He does still care, doesn’t he? That fall was the first “Plano” gathering, moved to Dallas because so many showed up, thousands and thousands of orthodox Episcopalians coming together for the first time from all over the country to pray and worship and listen to one another as we thought through next steps. It was an incredible gathering from every facet of the church. But still I wasn’t ready to give up on the Episcopal Church. I went home and was elected Lay President of Region VII in the Diocese and determined not to give up, to find some way for Virginia to take the lead away from the edge of the cliff. For the next two years I worked hard to find ways of building bridges between the progressives and the evangelicals in the region, as well as the Diocese. The coalition of rectors and wardens began to meet together and the Reconciliation Task Force was formed. I made new friends in unexpected places. I was reelected to the Truro Vestry. I wasn’t ready to give up or give in. I certainly couldn’t leave. I was now a delegate to the Annual Council of the Diocese of Virginia and working with others to find ways for us to hold on to the members of our parishes who were deeply distressed by what had happened at General Convention, not only in the actions that were taken, but by the theological wasteland that was revealed when those actions were attempted to be justified by Episcopal leaders. The chasm was widening and it was becoming harder and harder to bridge it, most of all because there were so many in the Diocese of Virginia who refused to believe that there was any problem. The release of the Windsor Report helped reveal that the problem was severe, but for many in the Diocese it still wasn’t clear what the purpose of the Anglican Communion was except to provide a way for Virginia to stay connected to the Mother Country and allow the Bishop to have tea with the Queen every ten years. And while parishes throughout Virginia had been involved in Dioceses in Africa in mission, it was one thing for Virginians to go over “there” and help out. It was quite another for Africans to turn around and come over “here” and tell Virginians what they thought or believed. The division was growing. Meanwhile in Region VII we were focusing on the Task Force on Reconciliation report, inviting speakers at our Council meetings to discuss aspects of reconciliation in an attempt to find it amongst ourselves. But the more we focused on reconciliation, the more we began to recognize how far apart we all were, how deep the divisions really were. While we had a great turnout for our council meetings, each one illustrated more and more that the divisions among us were profound and that we were, as the Reconciliation Report had accurately described, at a Level 5 division. How could we move forward without tearing each other apart? The Virginia coalition of rectors and wardens continued to grow, adding new members at each of its monthly meetings. By the summer of 2005, it was clear that the evangelical parishes were facing crisis – and by September of that year, twenty rectors and other clergy met with Bishop Lee to try to share their hearts that the crisis in the Episcopal Church was real and it was local and it was worsening. Bishop Lee responded finally by creating his Special Committee, appointing the members personally and selecting as its chair his own chancellor. That special committee was meant to be his voice and the voice of the diocese to find a way forward amicably and as a witness to the larger church. It was announced while some of us were up in Pittsburgh at the Hope & Future Conference in November 2005. The Bishop’s Special Committee continued to meet and slowly began to make progress, beginning to design together what would become the Protocol for Departing Churches. Under the leadership of the Diocese of Virginia chancellor, with the former Standing Committee president, chair of the Reconciliation Task Force, rector of one of the oldest and largest parishes in the diocese, former Chancellor for the Diocese of Virginia, and a parish trustee, together they all worked diligently and tirelessly to help find a way forward that would be a witness to the larger church. But it was hard – and sometimes very painful – work. But by the time General Convention in Columbus came in 2006 it was looking bleak. The pronouncements made by the friends who had joined AMiA after Denver were looking quite accurate now, five years later. It seemed more and more that the Episcopal Church was convinced that they indeed were doing a New Thing and this New Thing was good. To oppose this New Thing was to oppose cultural and spiritual progress and enlightenment. And yet, I went to Columbus still hopeful that we might be able to find someway back, someway to change the course. I went, having been elected twice as Region VII president, having been to countless diocesan and regional council meetings, coalition meetings and vestry meetings, having met personally with the bishops – sometimes in very frank and transparent conversations. I had also lost my mentor and friend, Diane Knippers. I had tried to learn everything I could from her, to see how she was able to stand firm for the faith and still keep her sense of humor and her hope, to the very end. She had dedicated her life to the renewal of the Episcopal Church and I wanted to honor her memory and dedicate myself to follow her example, something I still wish I could do better. Her courage, her optimism, her intellect, and her grace are burned into my memory and whenever I get discouraged I ask myself, now what would Diane say right now? I may not get it right, but I ask the question and sometimes that has kept me from going over the cliff myself, if only sometimes just barely. Columbus saw the birth of this blog and meeting a whole new amazing crop of folks, others in my own generation – some new to the cause and others long-time veterans. There was John Guernsey and Jim Simons, still working tirelessly around the clock, faithful and still with their humor intact. But it was clear by the end of General Convention 2006 that the divisions were too deep, that what was now The Episcopal Church (TEC) was headed in a different direction than its Anglican roots. What were we going to do? For over twenty years I was a ConCom. In December 2006 I began to envision another way, to choose being Anglican over being Episcopalian, to begin to grasp that to be Anglican may not mean being Episcopalian. But for right now I am still both, Episcopalian and Anglican. I’m in a lifeboat, looking for shore. Not long before General Convention in Columbus, I was reaffirmed an Anglican by the former Archbishop of Canterbury, Lord Carey. It was important to me that – as much as I might be tempted to do something different – I was committed to remain Anglican. I don’t supposed I ever dreamed I’d be thinking about attending a hearing this Friday or that my name would be on a lawsuit that also contained the church and diocese I loved so much, for so long. I’m taking the September 30th deadline seriously because I’ve learned over the years that these Anglican leaders mean what they say and say what they mean, especially those who have known persecution. They aren’t interested much in religion either, or positions of power – but in Jesus Christ and Him crucified. “Therefore I have been crucified with Christ, it is no longer I who live, but Christ who lives in me,” is the testimony of their lives. Even after all the mean, mean, mean things that TEC leaders hurl at them, they will not give up their joy. When I feel tempted to toss in the towel I think of them and realize that if they don’t give up, why should I? Yes, I still care about this church, the Episcopal Church and its place in the Anglican Communion, returning to its roots, where Ridley and Latimer and then Cranmer gave their lives in witness to the truth of Jesus Christ and a Church founded on Him. I still care for the people in it, for those now outside it, and for those who are seeking ways to remain in it. To see what is happening to this Episcopal Church is one of the saddest things I’ve ever known. There are times when I do feel like we are at Dunkirk and we are trying to get as many in the lifeboats as we can, to not just sail away but to rescue as many as we can as we sail back home. There are many who would perish and others that would flee. There are times when I shudder at the apparent friendly fire and pray that we keep our own powder dry and remain fixed on our Redeemer, who is the one who saves us. Our trust remains in Jesus, who will save us all, if we but ask. O Gracious Father, we humbly beseech Thee for Thy holy Catholic Church; that Thou wouldest be pleased to fill it with all truth, in all peace. Where it is corrupt, Purify it; where it is in error, direct it’; where in any thing it is amiss, reform it. Where it is right, establish it; where it is in want, provide for it; where it is divided, reunite it; for the sake of Him who died and rose again, and ever liveth to make intercession for us, Jesus Christ, Thy Son, our Lord. Later: I have been thinking tonight, as I have been reflecting on the past, that it is indeed a fact that the whole testimony is a miracle. That we’ve come this far is a miracle. We shouldn’t even have all gotten along for minute – and yet we have, not through our own strength and inginuity, but through the power of the cross of Jesus, that in our weakness, He makes us strong. Hallelujah. I can remember a meeting in Denver, where the gathering of the orthodox were split into two sides – one side of the room were the Evangelicals and the other side of the room were the Anglo Catholics. I think there was some amazement that at least we were all in the same room, though there was an invisible line going through it. Each had their own host of computers and technicians and each would huddle in little knots of conversation, but neither would cross into the other’s territory. And rarely did everyone speak. Well, it started that way, but it didn’t end up that way. As more and more deputies poured into the room while General Convention continued, it wasn’t long until people were spilling into all the areas of the room, there was simply no more room, and after a while any attempt to have “separate quarters” was finished. The knots broke up. Techs came by and fixed everyone’s computers. All our paper got jammed in the copiers and we’d laugh and start over. That is the last time I saw that invisible line. From then on, Anglo Catholics and Evangelicals walked together and we were so busy we didn’t even realize the miracle that had taken place in our midst. By Columbus we were all never quite sure who was what. I can remember another time when a delegation from Ft. Worth stood together for a mini briefing. They were all standing in a circle, listening very intently to someone giving them a briefing. As I moved closer, I realized it was the Rev. Allison Barfoot who was standing in the middle, talking quickly and decisively and they were standing around her, taking notes, nodding their heads, unified. As they all walked on to return to the House of Deputies, their questions answered, I don’t think anyone realized what had just happened. I can remember another time there was a room in Columbus filled to capacity and it was fairly intense. It was the night before B033 was to come up and there was a lot of conversation about where to go, what to do. It was lively, there were flipcharts and markers flying all over the place, some were sitting on the floor nearly under the table with their laptops typing madly, others whispering into their cell phones from corners of the room, others gulping coffee forgetting that the wee hours of the morning would soon be upon us, and lots of rather colorful language. But in the end, as everyone poured out their thoughts and feelings, unity began to happen – all the folks in the room began to turn to one another, encourage one another (“great idea, put that down!”), and then laugh together and before we knew it, there was unity. We poured ourselves back into prayer and thanksgiving. It was suddenly simple. How did we get there? How did that happen? Well, there were thousands at home praying – and miracles happened right in our midst. I remember sitting at a table for dinner across from Bishop Keith Ackerman as he was having a joyous conversation with a woman priest from Florida, laughing together like old friends – which they are. How is it that we can hold some pretty signficant differences on theology, and yet love and care for one another when it really matters? How is that we forget about ourselves and our own wants and look to meet another’s need? How is that the Holy Spirit brings to us healing when we least expect it? I cannot describe the pain I felt standing by Diane Knippers bedside when she died, completely shocked that she was gone the moment that a Church, when we all really needed her. What was the Lord thinking? And yet all around me were people who loved her and loved each other so dearly that I knew that her greatest legacy was found here, with the ones she loved, not in her accomplishments – which were many, but in the people. That is what matters. The people – Jesus gives us each other for times like this, in times like this. He picks them, we live with them. Whether we are FedComs or ConComs or PomPoms – we have each other. Tonight I see all ready how the TEC progressives are turning on the ConComs at ACI on the Bishop-Deputies list and my heart goes out to all those guys, still slugging away in the trenches, not giving up. No more slinging arrows, not tonight, not tomorrow, not next week or even next year. We’re all on the same side, perhaps in different boats, different colors, some love Calvin, some love Wesley, some love Augustine, some love Aquinas, some lift up their hands, and some bend the knee, some prefer Rite I and some prefer Rite II and some prefer 17th century Cranmer, but all are headed in the same direction – towards the cross of Jesus Christ, for by His stripes we are healed. This entry was posted in AMiA, Anglican News, Archbishop of Canterbury, Diocese of Virginia, Episcopal News, General Convention, http://schemas.google.com/blogger/2008/kind#post. Bookmark the permalink. I’m glad I read your explanation of the difference between ConCom and FedCom. Sarah Hey’s essay left me confused.I guess I’ve been leaning more toward the FedCom than the ConCom position for several years now. I realized after the 2003 General Convention that sooner or later either my parish would have to leave TEC or I would have to leave as an individual. However, prior to joining my present parish I spent several years outside TEC at a nondenominational church. I found out the hard way that being nondenominational doesn’t necessarily guarantee biblical orthodoxy.I’m glad my parish made its choice and joined CANA. And, to be honest, if AMiA affiliation had been offered as an option, I would have been fine with that as well. At least I’m no longer affiliated with a denomination which is clearly going down the wrong path. I’ll keep this Friday’s hearing in my prayers. OK, the alphabet soup and the jargon have me thoroughly confused: Is that a journey from comcon to concom to comcom to concon to fedcomcon to….The above should be appropriately illustrated with an woodcut from the Mad Hatter’s tea party. Fantastic post Mary. Thanks for sharing your testimony and what this fight has meant to you.Keep me posted how I can be praying on Friday!Hugs. Thank you for sharing your thoughts, I known this process has been difficult for you. Goodness, you’ve been journeying long and fighting the good fight for quite a while now, haven’t you? (I was one of many who benefitted from your involvement with NOEL back in its early days.) Thanks so much for sharing your story with us. And it does help me understand better the difference between a “concom” and “fedcom.” I wonder if my rector (Todd Wetzel+) was one of the smattering of others in 1994 whose name you never learned? Wonderful testimony, and some good recapitulation of history. But with respect, we really, REALLY need to get beyond the current navel-gazing which seems to afflict the best and brightest of the faithful. It is becoming more prevalent, and in some cases seems to be a refuge for those who do not wish to face the fact that events are requiring action. So much of what we are seeing is more appropriate to retrospective studies after the fact. For what it’s worth, I’m praying for you and all concerned on Friday; God knows what we need before we ask and gives all good gifts, so I have confidence that God will answer according to His will. Peace to you, and I’m glad to know more of your story. Thank you for sharing it. Thank you for this beautiful post, Mary. You’ve captured the strange combination of crushing sadness and burning hope in Christ so many of us feel as our lifelong church home goes beneath the waves. Oh honey, get over yourself! Look around you at the coffee shop on Dupont Circle, one of the Gayest neighborhoods in America. Why do they all gather around each other, but to defend themselves from warmongers like you, Diane Knippers and IRD?Lighten up. Stop the self-justification (“Oh, how hard I’ve worked! Oh, how high I’ve risen in the movement! Oh, how much I’ve suffered!”). Enjoy the people around you in the coffee shop and allow them to be human too.Beat your sword into a plowshare, because by your deadly fruits we have known you. Have some pastry! Hey, Josh, I’ve read the end of the Book, you may just be on the wrong side. Those who endure to the end get to reign with the King when He returns, but not the lairs, idolaters, sexually immoral, those who practice magic. Sure it seem all fine & good now, eat drink and be merry, but trust you do not know the day or the hour your soul may be required of you. Babyblue, that was gorgeous. Thank you.Josh: A beautiful example of inclusion in action. BB, I will ask Todd+ after he gets back from India. (He’s on a short-term medical mission trip.) He’ll definitely be able to tell me if he was there but not sure if he’ll remember the sandwiches. Ya never know . . . I don’t visit here often, but I followed the link from Mark Harris’ blog. I’m glad to read your first-hand account of what the journey has been like for you. I’m hesitant to post a comment here, for I’m a Notorious Progressive. But I’m asking these questions sincerely, and not as a troll. I’m not hiding a “gotcha!” in my back pocket. It was inspirational to read your account of how the Anglo-Catholics and Evangelicals could come together, of the Fort Worth delegation taking counsel from a woman and of +Ackerman chatting as friends with a woman who is a priest. How come that “big picture” unity can’t happen between conservatives and progressives whose only dispute is on the interpretation of scriptures regarding homosexuality? Do you think there is <>any<> hope of rapprochement? Also, can you explain how/why you consider yourself an Episcopalian if (as I gather) you’re a leader in a parish that has affiliated with the Church of Nigeria? I’m not baiting you here, but asking honestly, for I do not understand. I left the Southern Baptist Church in the early ’80s and — thank God! — found the Episcopal Church. But I no longer call myself a Baptist. Is your still calling yourself an Episcopalian the same as my still calling myself a Southerner (which is in my bones), even though I now live in the Midwest? I’m trying to understand why folks who have “shaken the Episcopal dust off their feet” still focus so much energy on the Episcopal Church. I commend you for the raw honesty of your writing in this essay. It helped me to put a human face on somebody on the other side of this sad divide.And, by the way, the prayer you cited [“O Gracious Father, we humbly beseech Thee for Thy holy Catholic Church …”] is the one I’ve been praying humbly at least weekly since GC03. If our beloved church has erred, I pray God will correct and reform it. And I especially pray that God will reunite at least this little corner of The Church that is the Anglican Communion.The Internet is a “cold” medium. But I hope my comments come across in the irenic tone I intend. Apologies for consuming so much bandwidth!